SACRAMENTO, California, April 21, 2017 (ENS) – Executives from three California state agencies Thursday caravaned from the state capital Sacramento to the San Francisco Bay Area and back to demonstrate how easy it is to drive and fuel hydrogen fuel cell electric vehicles in California. They were celebrating the state’s global leadership in getting more zero-emission vehicles (ZEVs) on the road. “To achieve California’s climate change and air quality goals, we are putting our dependence on fossil fuels in the rearview mirror thanks to the availability of clean vehicles and clean fuels,” said California Air Resources Board Chair Mary Nichols from her spot in the caravan. Also making the round-trip drive two days before Earth Day were representatives from the California Energy Commission, the Governor’s Office of Business and Economic Development (GO-Biz), and other members of the California Fuel Cell Partnership (CaFCP). This public-private partnership to promote hydrogen fuel cell vehicles in California counts among its members state agencies, automakers, station operators, and air quality groups. Hydrogen fuel cell vehicles and other ZEVs play an important role in the state’s efforts to reduce its greenhouse gas emissions and petroleum dependence, and to improve air quality. CARB Chair Mary Nichols drives a fuel cell car as her regular means of transportation. “As a fuel cell EV driver, I am excited to hit the road to show off these fast, fun cars. With a full tank of hydrogen from one of the growing number of strategically located stations, I can go anywhere I need to go and as far as I used to on a tank of gas,” said Nichols. “These cars are available now along with financing incentives funded by proceeds from the state’s cap-and-trade program,” she said. 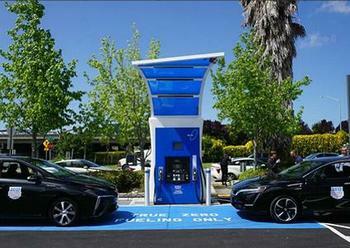 The caravan, which included a Honda Clarity Fuel Cell car and a Toyota Mirai, drove from the State Capitol to True Zero hydrogen refueling stations in Hayward and San Jose, with a photo stop at Treasure Island before returning to Sacramento. True Zero, Honda, and Toyota are all CaFCP members. Additionally, a hydrogen fuel cell electric bus operated by the Alameda-Contra Costa Transit District was displayed in Hayward. California state agencies collaborate on a range of initiatives to help reach the state’s goal of getting 1.5 million ZEVs such as hydrogen fuel cell vehicles on California roads by 2025. These initiatives include Energy Commission investments in an initial network of 100 public hydrogen stations needed to help make hydrogen fuel cell vehicles a practical option for consumers. The Energy Commission has funded 48 hydrogen stations, with 27 now open. Another 16 stations are proposed for funding, pending Energy Commission approval. The public-private effort to build a network on this scale is the first of its kind in the world, placing California is on the cutting edge in the adoption of hydrogen fuel cell electric cars. “The Energy Commission is committed to investing in a network of conveniently-located refueling stations to support the fuel cell electric cars that are on the road now and to encourage more consumers to consider zero emission options,” said Energy Commissioner Janea Scott. GO-Biz helps station providers, local government and developers with planning and permitting of new stations. “California is proof positive that investing in transportation infrastructure and the deployment of zero emission vehicles leads to statewide economic growth,” said Tyson Eckerle, GO-Biz deputy director for zero emission vehicle infrastructure. “The state has made strategic investments to build new hydrogen fueling stations and as a result, fuel cell vehicle owners can now drive throughout the Bay Area and beyond with the absolute confidence that they will reach their destination and have enough fuel to take the scenic route home,” Eckerle said. Incentives funded by proceeds from the state’s greenhouse gas cap-and-trade program are available to help Californians lease fuel cell powered electric vehicles. “Clean hydrogen powering fuel cell electric vehicles provides huge benefits for all including cleaner air, reduced carbon emissions, the elimination of petroleum dependence and economic growth,” said Joel Ewanick, president and chief executive of True Zero.